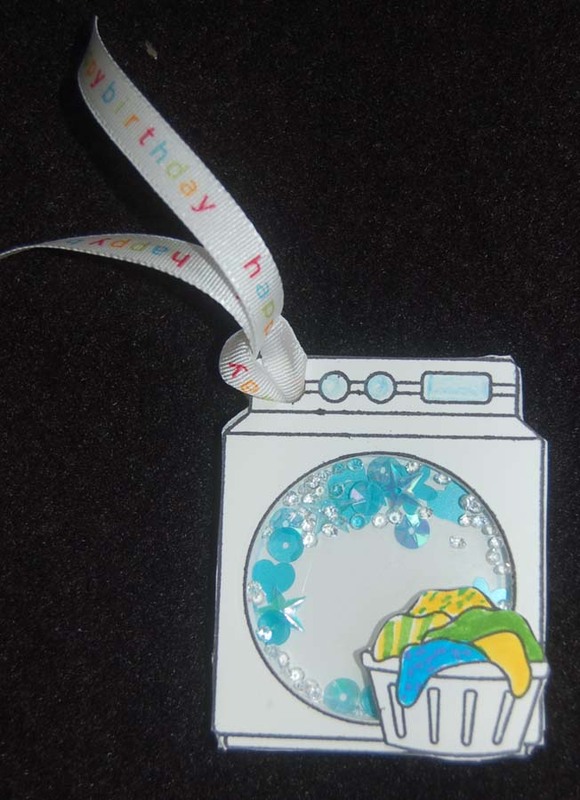 This washing machine image from Lawn Fawn (set available at HM Ben Franklin Crafts) was begging to be made into a shaker tag....so I made it and filled it with sequins and diamonds from the Queen and Co. 'Toppings' collection which can be purchased at BFC. 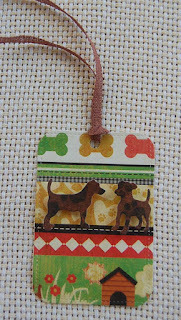 In the back of this tag I stamped a sentiment that came with the LF set. The soft cling stamps allowed me to curve the words on the acrylic block so they could be stamped to fit on the back of the washer tag. Here is another version of the tag with words stamped inside the shaker. I love the cute faces that you can stamp on the clothing before putting them in the washer. 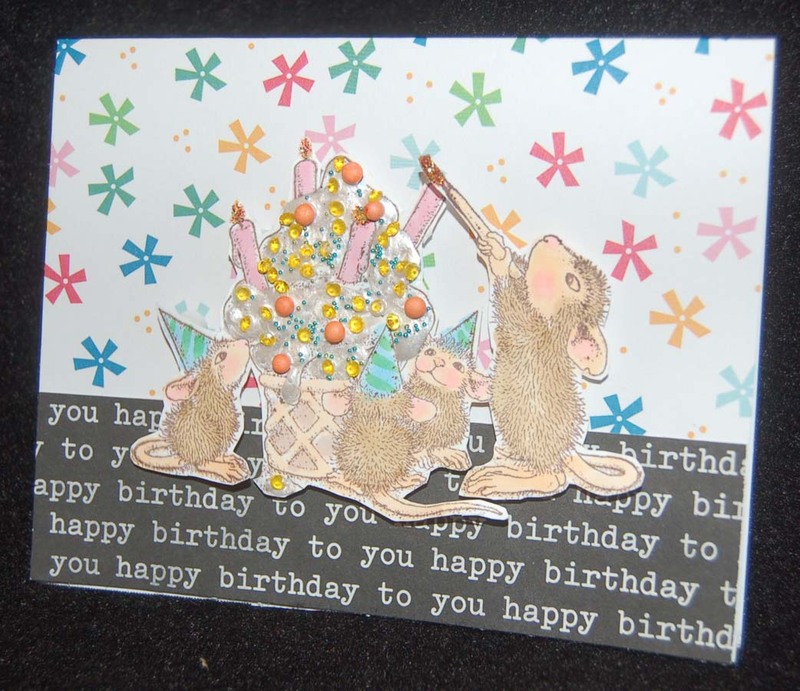 The circles were cut with one of the circle dies from the Sizzix circle die set. I used two layers of thin foam sheets to make a deep recess for the shaker. The washing machine was lightly stamped on the foam sheets so I would know where to place the circle die before running it through my Big Shot machine. 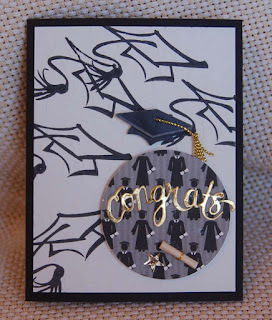 After returning from a rather long trip, I realized I had only a week to put together a graduation card and post it on this blog. 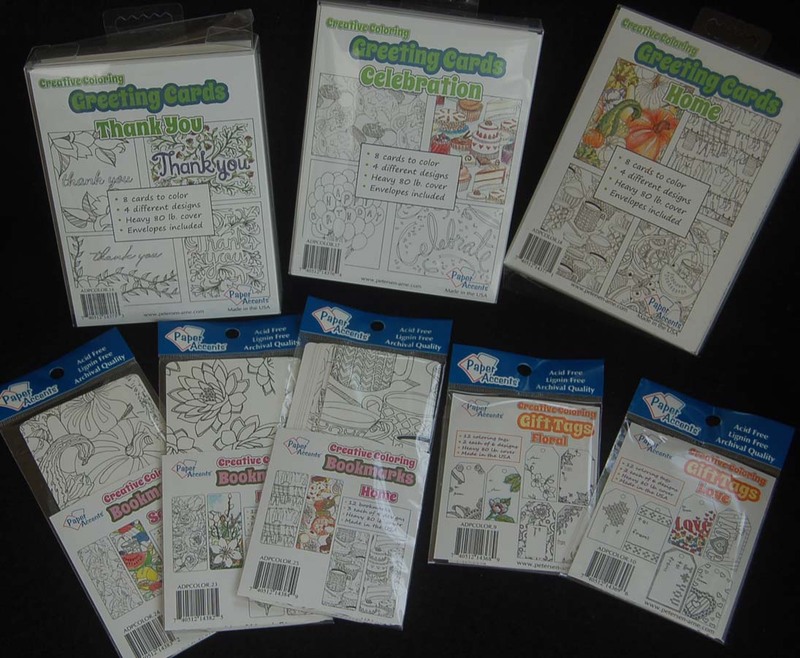 A quick trip to HM Ben Franklin Crafts made creating these cards a snap. 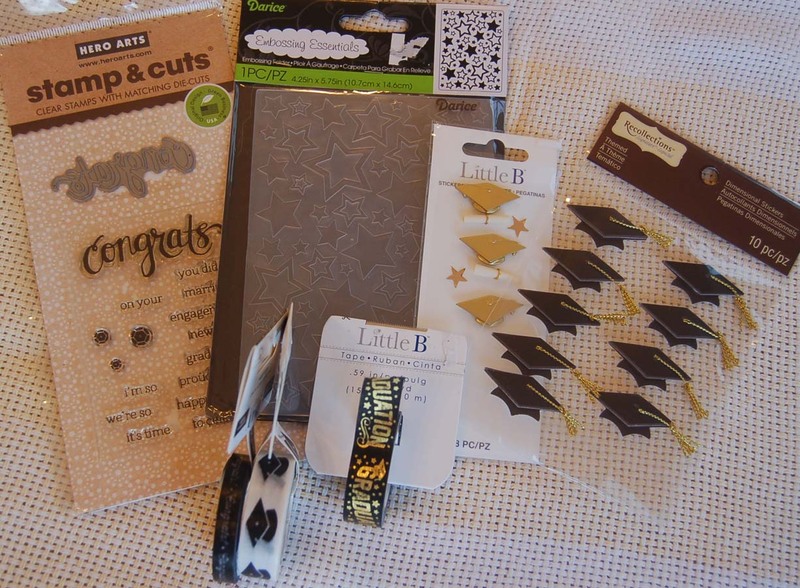 I purchased some double sided printed card stock, Little B and Doodlebug washi tapes, Little B stickers, Darice star embossing folder, and a Rubber Stamp Plantation brushstroke graduation cap rubber stamp (sorry, it's not in the supplies photo). 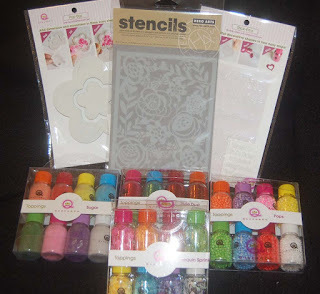 I started by stamping the cap several times on a white panel before using the embossing folder to impress some stars on the panel. Sorry that the photo just barely shows this effect, but I think it looks really good. 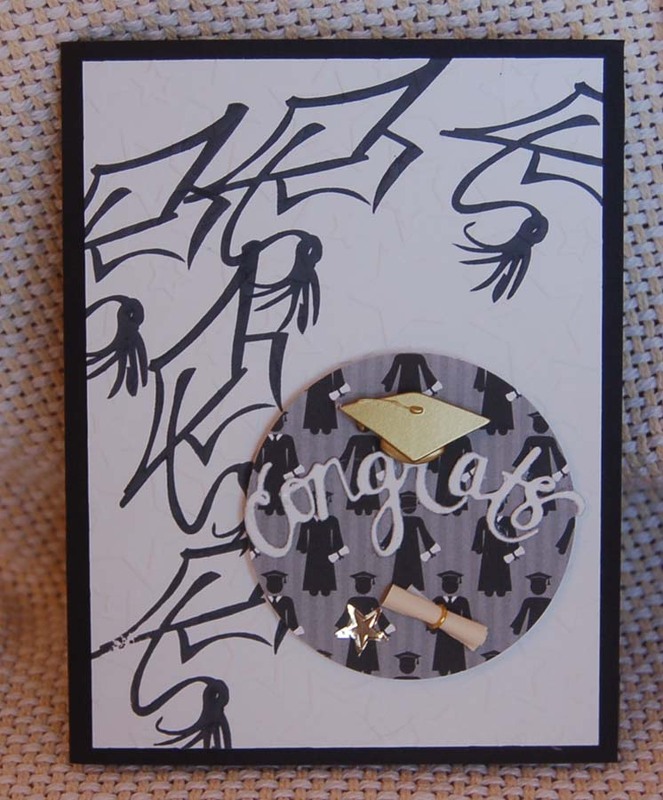 Next I punched out a 2-1/2" circle from the DP and die cut the 'congrats' with the Hero Arts die. 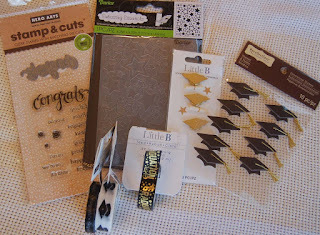 It was easy peasy to attach the die cut word and stickers (the black cap was from my stash). Voila! 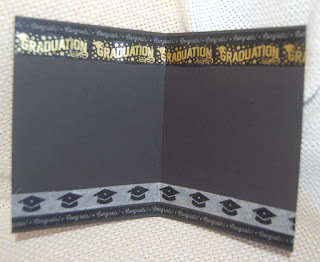 Instant card! Here is what the card looks like with the inside decorated with the washi tapes....so easy to do! 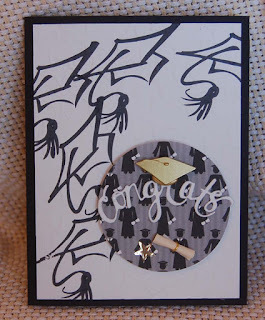 I hope this post has shown you that you don't need lots of time or supplies to make a special handmade graduation card. 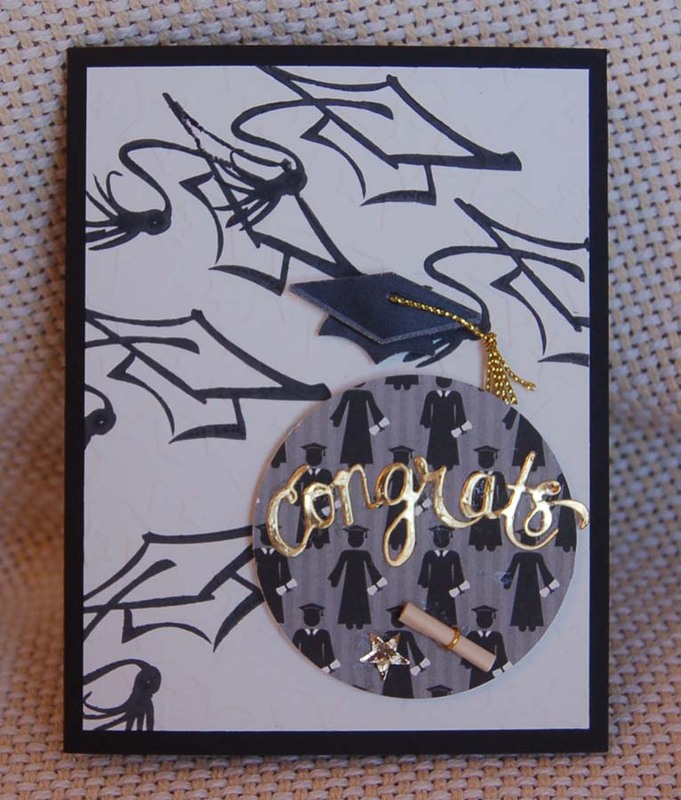 Congrats to all Grads! If you are not interested in using the Queen & Co. 'Toppings' to make shaker cards, you might want to use them as sprinkles on ice cream/frosting. They come in delicious colors and really do look good enough to eat. I am especially fond of the 'pops' and 'diamonds'. 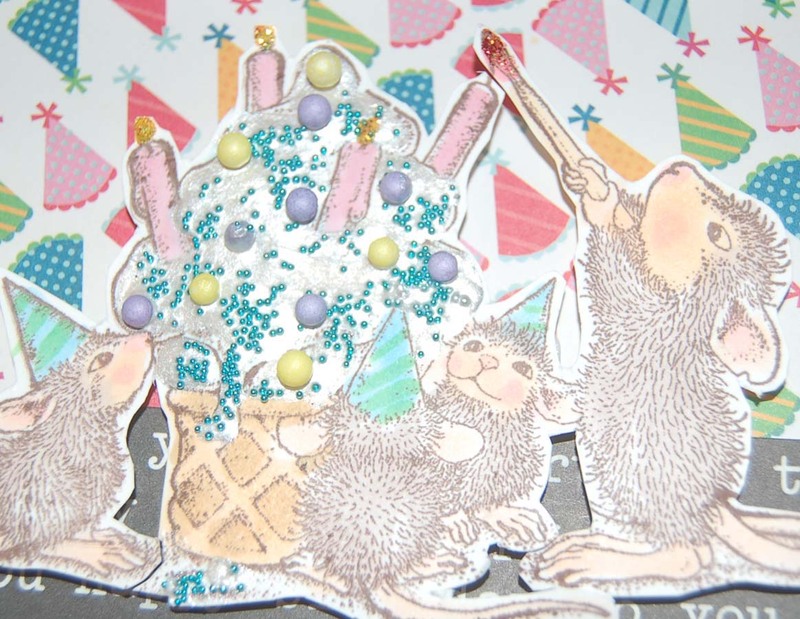 Using a House Mouse Design stamp and pre-made cards by Pebbles and American Crafts, I created a simple card and had fun adding the sprinkles....baking without the calories! Here is a different version of the same basic theme. The image was colored with Copic pens and the flames were done with Scribbles. This close up shows how yummy the sprinkles look on the Bo Bunny 'Sugar' pearlescent paint. 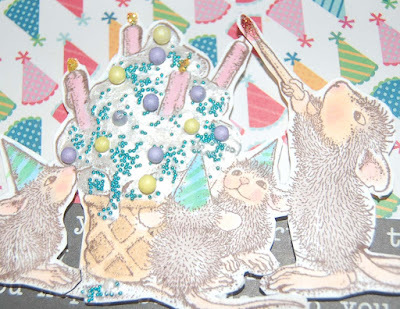 I think that this card looks the best of the three versions because the background does not over power the mice and ice cream. Go and check out the scrumptious 'Toppings' now at HM Ben Franklin Crafts. These Queen & Co. products will certainly put you in a sweet crafting mood. Thanks for visiting this blog site. I hope you will return often and leave a comment if you have some free time. I enjoy hearing from you. This photo doesn't quite show off the wonderful new Queen &Company shaker 'stuff'' I used in my fish tank. 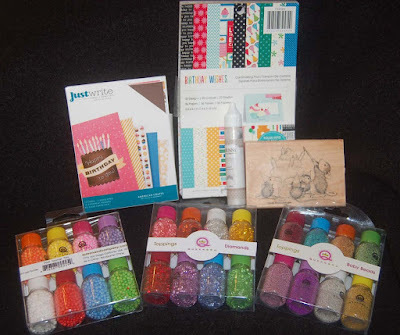 There are so many new styles and colors (available at Ben Franklin Crafts) to choose from that it makes my mind spin with creativity. For this tag I used sparkly clear pieces and tiny metallic blue balls. 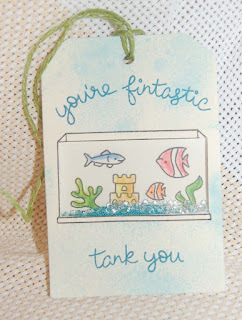 After stamping the fish tank on a die cut tag, I cut our the rectangle with a craft knife. Then I die cut two thin foam sheets using the same Little B tag die and I cut another blank tag for the back. I traced the tank shape onto the two foam tags and cut them with the craft knife. I stamped the words onto the front of the tag and traced the shape of the tank opening onto the bottom tag before adhering acetate to the back of the cut out tank. Next I glued the two foam tags to the back of the tag and filled the opening with the shaker elements. 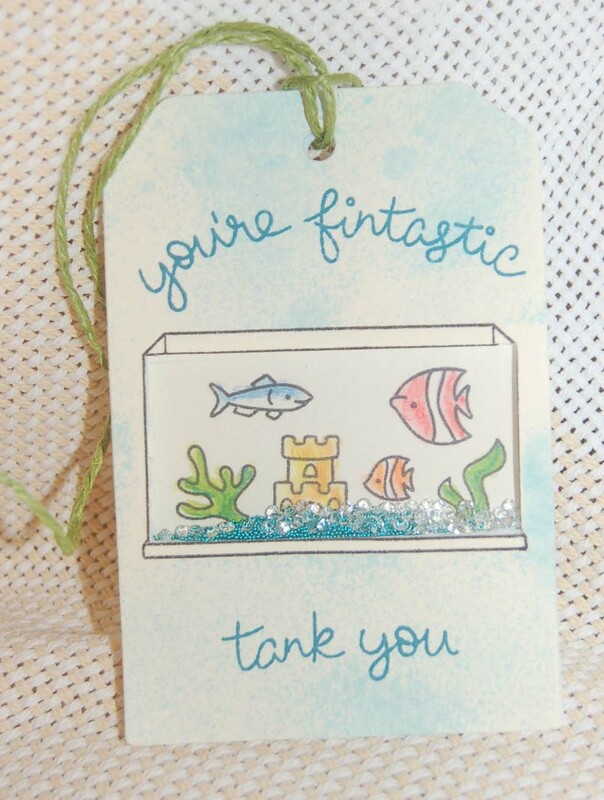 Finally I stamped the fish, castle,and plants within the traced area of the tank and colored them all with watercolor pencils.The back of the tag was glued onto the tag front containing the shaker pieces. 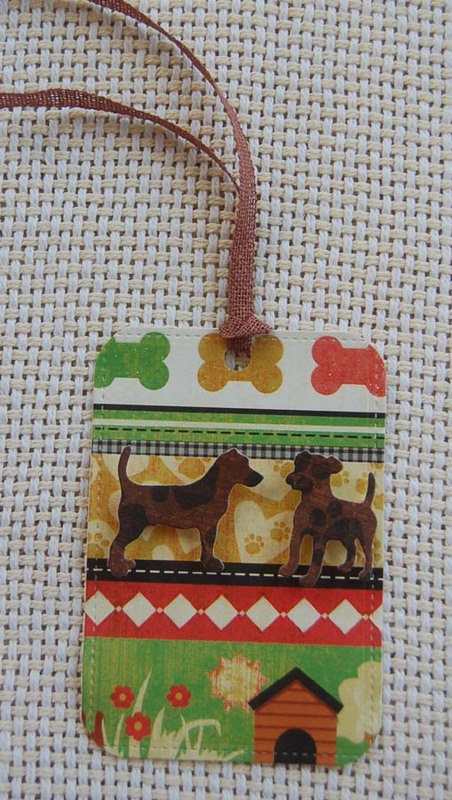 This easy to make shaker tag tied to a goodie bag is going to Stacey's Pets, who recently did me a favor. 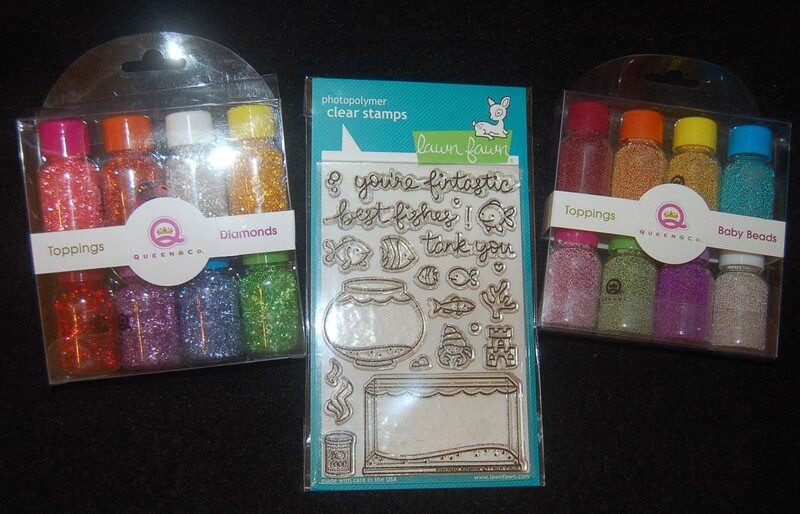 I hope you will check out the new Queen &Company bottles of shaker pieces and the clever/cute Lawn Fawn stamps now being sold at HM Ben Franklin Crafts. Happy Crafting! 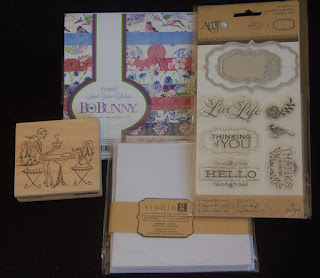 Recently, I had the opportunity to try out some new Queen & Co. products for making shaker elements on cards, boxes, tags, etc. 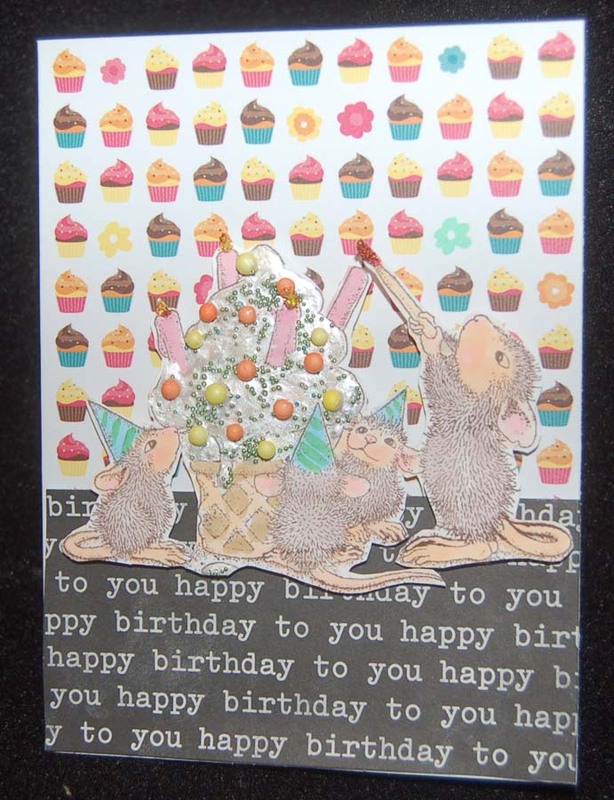 For the background of this card I used a Hero Arts stencil and Distress Inks. This photo looks a bit washed out because I was trying not to get the glare on the acetate. The flower shape is a foam cut out that comes with the acetate in a set from Queen & Co. Although, it was quick and easy to assemble the shaker, I had a problem with the static on the little Styrofoam balls. Maybe I should have rubbed the acetate film with a dryer sheet first. I did like the double-sided adhesive words in the Queen & Co. sets; but because they were clear, it was a bit of a challenge to line them up. I used the fine glitter on the words and decorated the flower frame with the glitter too. 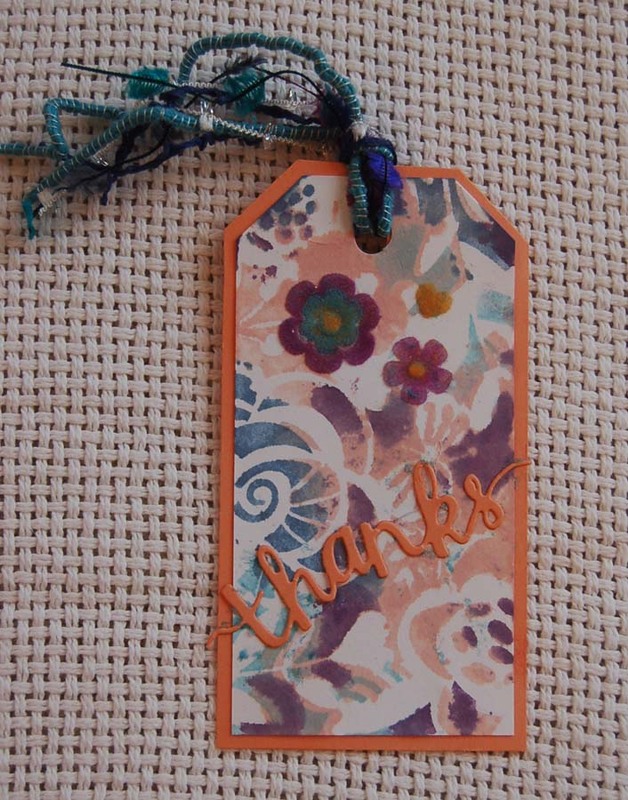 This photo of a tag made with the same stenciled paper shows up the colors better. 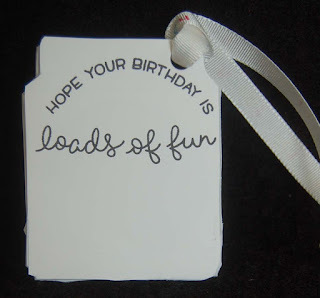 I like making tags as practice pieces. The double sided adhesive flowers were colored with the Queen & Co. flocking. 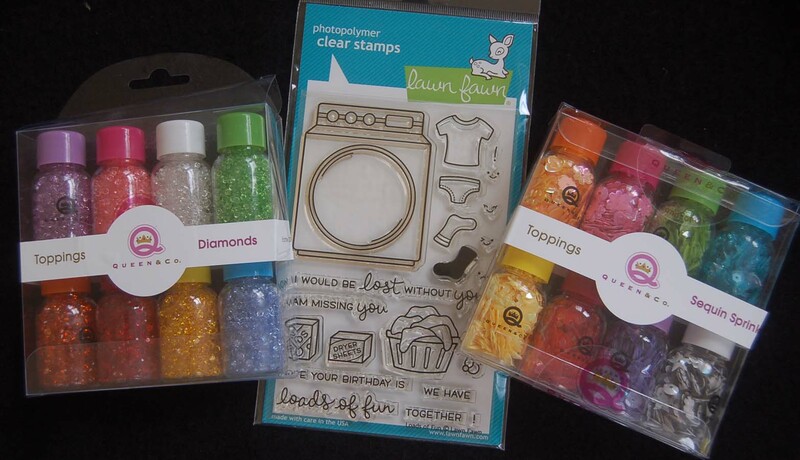 I enjoyed testing out these products because it was like playing with candies. Don't you just love the luscious colors? 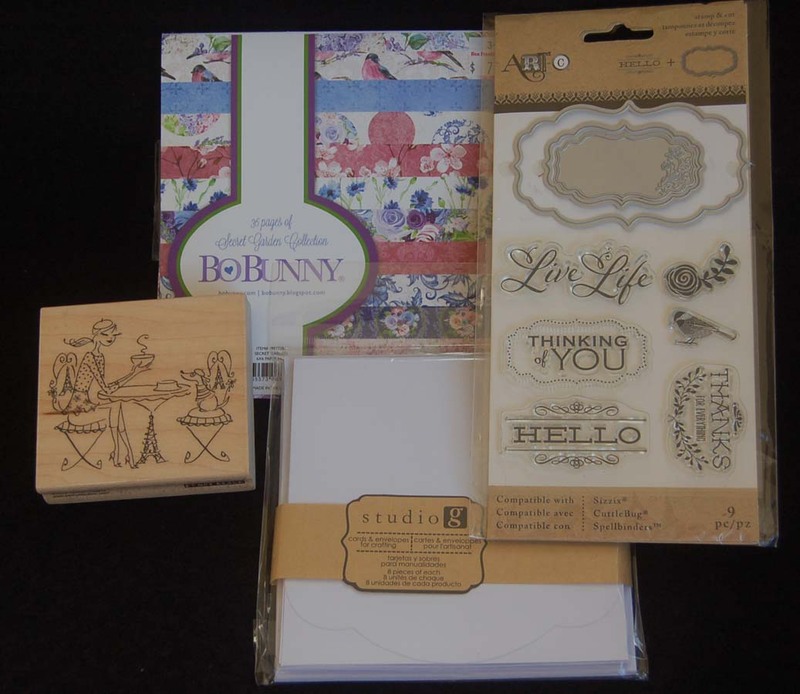 Hope you'll checkout these sweet new products at HM Ben Franklin Crafts. My sister is obsessed with her dog and wants to take her everywhere. 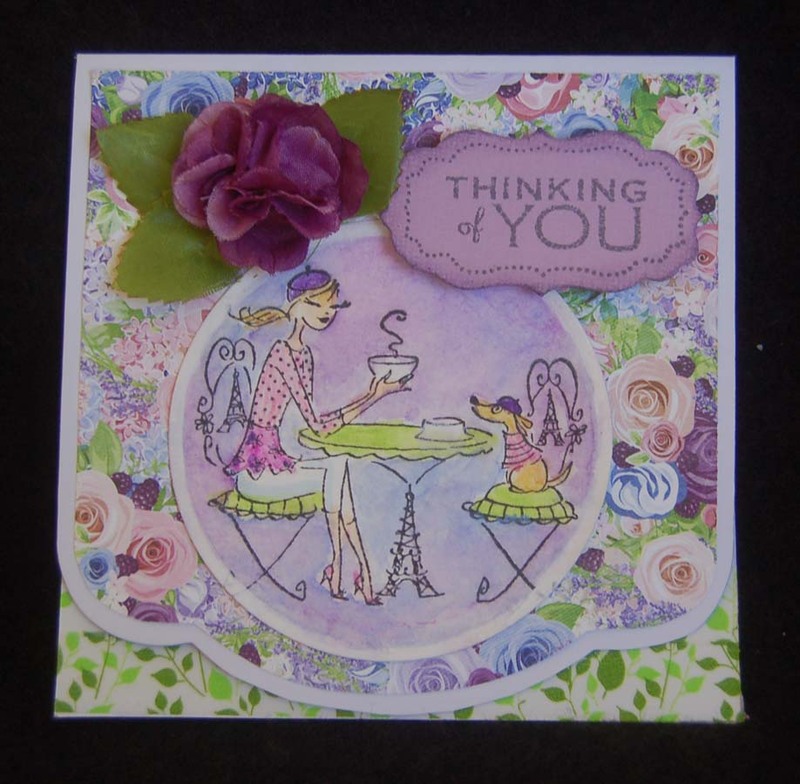 I selected this Penny Black image because it reminded me of my sister and I wanted to send her a thank you note. 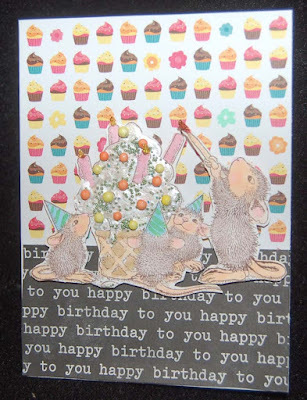 The pretty rose print card stock paper is from a Bo Bunny 6x6 pad. 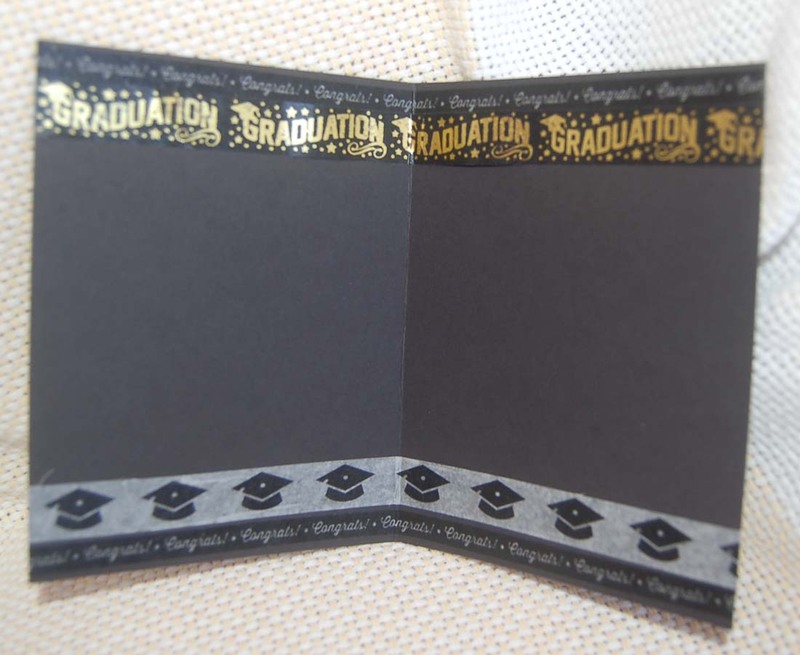 I cut it to fit the Studio G card with a scalloped front flap (only $1.25 for the pack at HM Ben Franklin Crafts). I colored the image with both Prisma watercolor pencils and Kuretake watercolors. 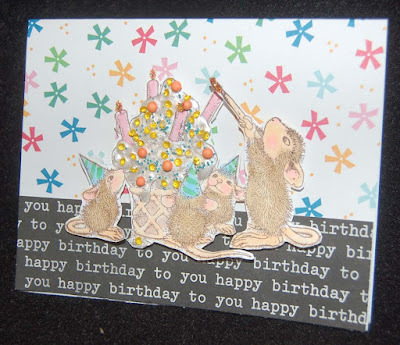 For the inside of the card I attached some leaf print washi tape and another label made with the ArtC dies and stamps. The purple flower was a rose from a bouquet with plastic stems. I took the petals off and tried to reassemble the rose with glue. 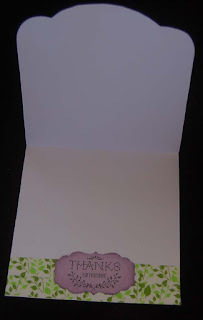 As you can see it now looks more like a peony, but at least it sits flat on the card. The leaves from the bouquet were too large so I trimmed them. 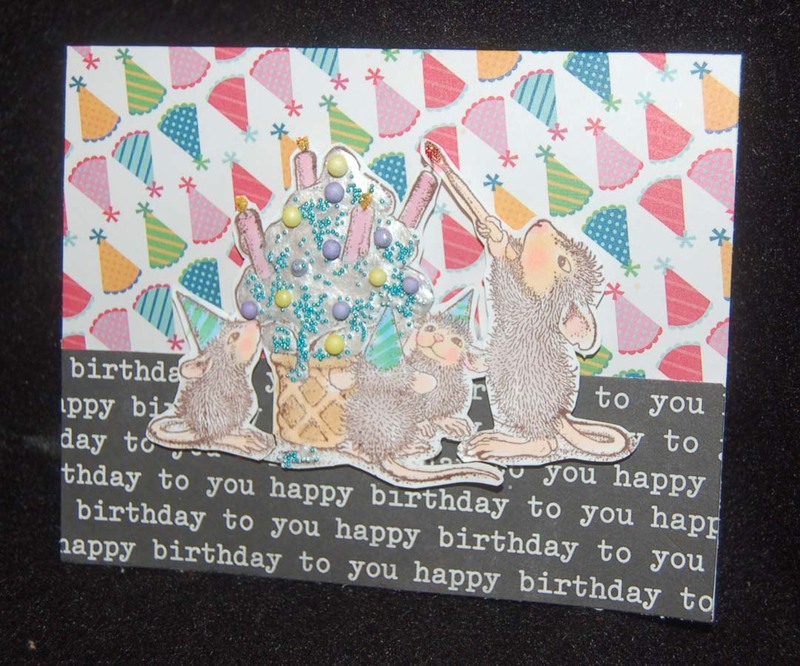 Overall, I am pleased with this card even though I had to do the coloring twice because I ruined my first attempt. 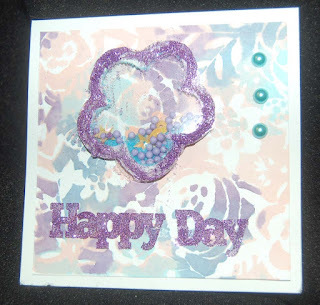 I am now in a springtime mood and plan to make more cards with flowers and birds. I hope you'll visit again to see my new posts. Thank you for stopping by! I recently received an unexpected gift from the sister of my brother-in-law. 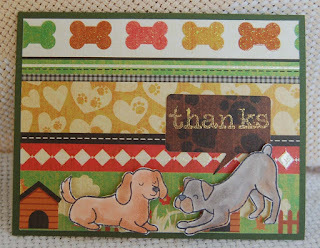 Although I don't know her well, I do know that she loves dogs, so I decided to make her a dog-themed thank you card. 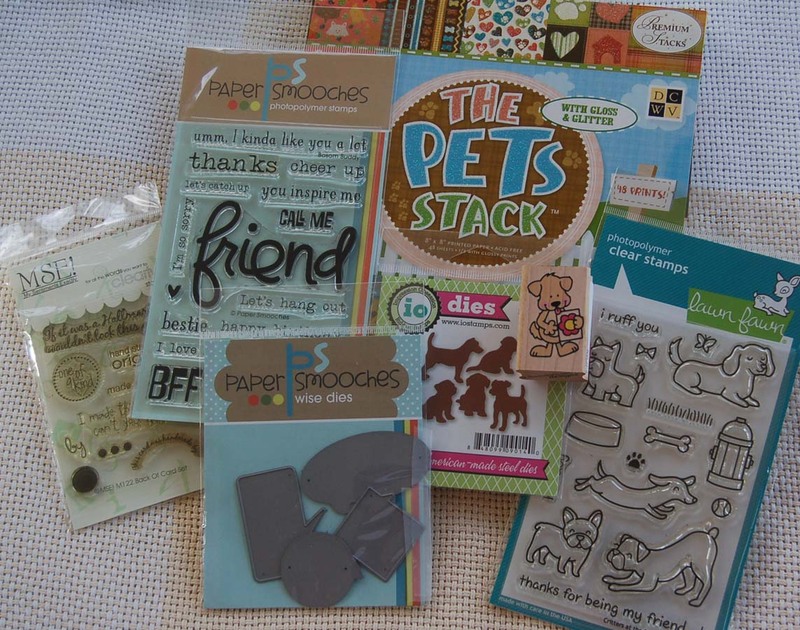 I started with some printed card stock from the 8x8 DCWV The Pets Stack. Since the paper looked like it was pieced together, I didn't have to do anything more except add the stamped (Lawn Fawn) and colored (Copic pens) doggies. 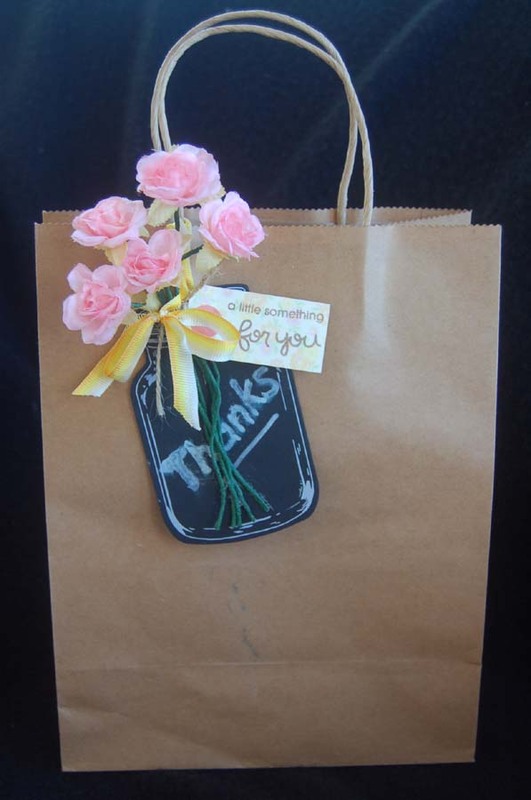 The 'thanks' was stamped (Paper Smooches) in gold and heat embossed with gold powder onto the Paper Smooches die cut speech bubble. 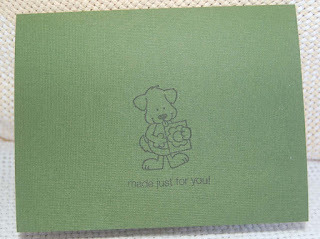 To make the card even more special, I decided to stamp something cute on the back. 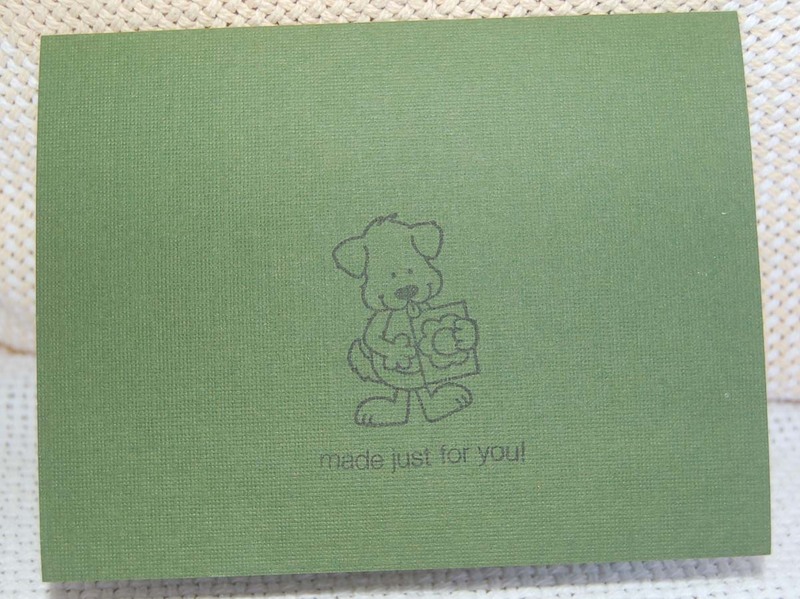 I chose a Dandelion Designs dog with a card image and added a MSE sentiment. Of course whenever I have leftover scraps I try to make a tag...once all the craft stuff are out . . . why not? 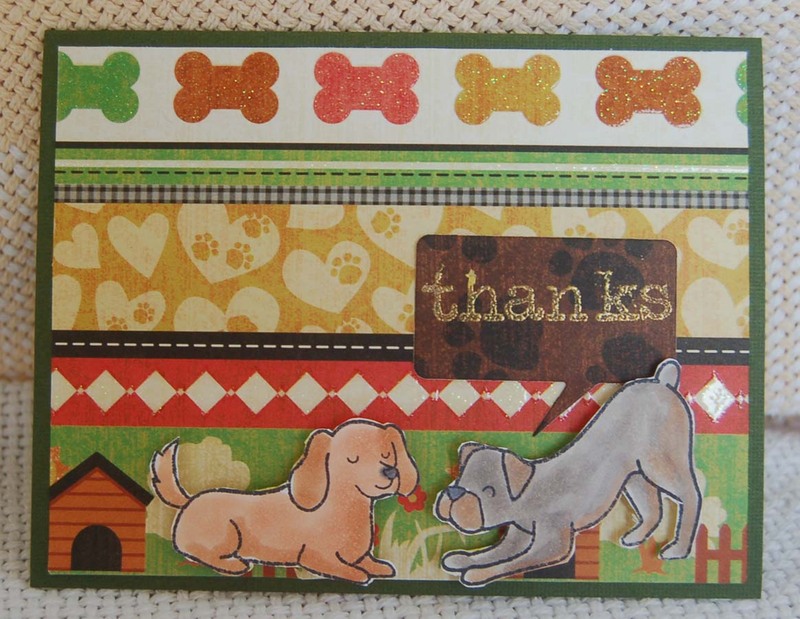 For this one, I simply cut out the tag and added (with foam dots) some dogs die cut with an Impression Obsession set. Adding a Heiko (from Celebrations) fiber ribbon completed the tag which went into my emergency stash. I think making a special handcrafted thank you card really shows your gratefulness. I hope this one conveys my thoughts. Thanks for stopping by. Did you enjoy this post? Love to hear from you. 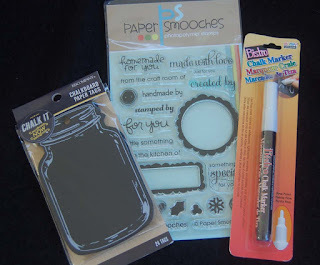 I love, love the K and Co. blackboard products, especially the jar shaped tags. Using the Marvy chalk pens it was easy to write 'thanks' on the tag. 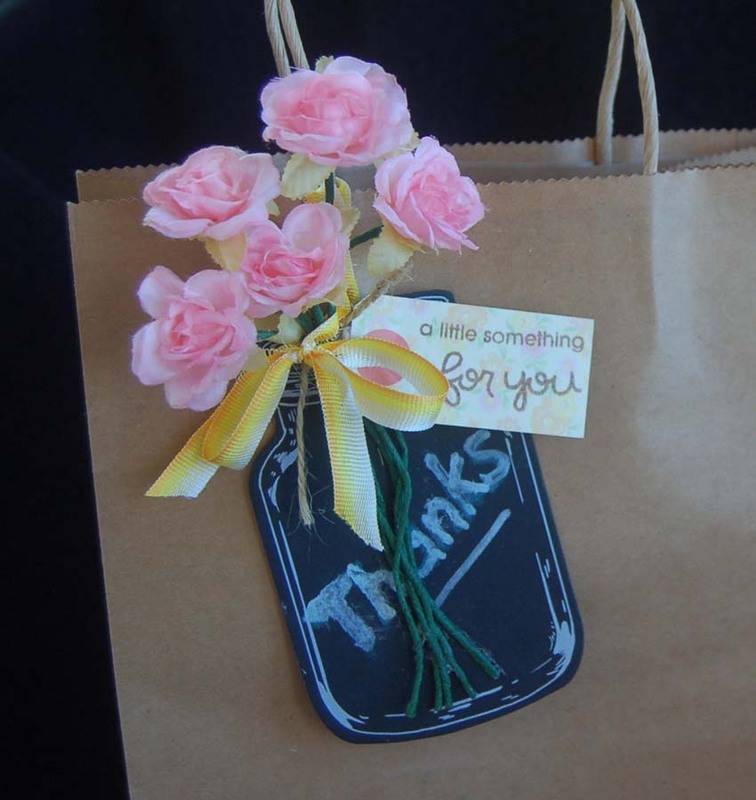 You could use chalk that is also available at Ben Franklin Crafts if you want to make the tag erasable. The flowers I tied together and glued to the tag had white stems so I wrapped them with green florist tape. 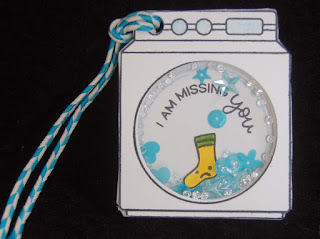 The little tag that I stamped the message on (with Paper Smooches sentiments) was from Japan, but you could easily cut out printed card stock scraps to make your own tag. 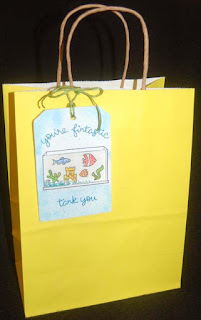 The bag was from a set sold at HM Ben Franklin Crafts and the ribbon is a Heiko soft and silky one from the Celebrations store. If you want to make the jar tag more realistic you could glue on a piece of acetate, then trim it to the correct size and shape. 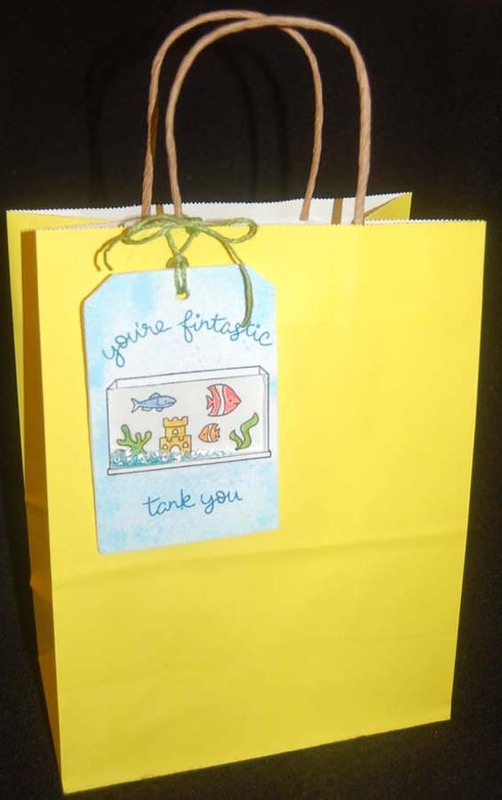 I enjoy whipping up simple gift bags because they make a great impression on the recipient. In this case, my gardener neighbor is getting a thank you for helping me...again! Thanks for stopping by....hope you enjoyed your visit.